“Print-ready” means that you provide The J. Willard Marriott Library Reserve/Cashier Desk with PDF files that are finalized and ready to be uploaded and printed. You’ve written, edited, and proofread your book, and it is formatted to look the way you want. Whether you hire someone to help or you format the book on your own, here are some helpful guidelines. The Espresso Book Machine is located on Level 2 of the Marriott Library at the Reserve/Cashier & Library Store Desk. When formatting a text on your own, it’s important to remember that consistency is key. Figure out what you want your pages to look like, and then apply the settings to the whole document for margins, tabs, font & point size, line spacing, etc. Do not use the space bar to align your text; use the tab key for any indentations (i.e. the beginning of each paragraph). If you want something centered on the page, highlight the text and click on the center tool. Same goes for aligning anything to any part of the page, whether you want everything left, right or centered, use Word’s formatting tools instead of the space bar. The trim size is the size of your book after it’s printed. 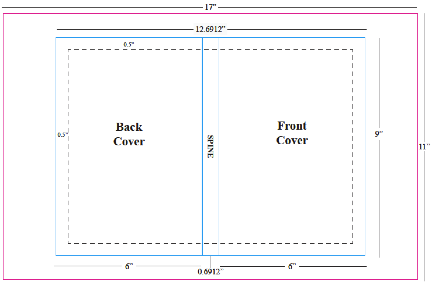 Indicated by width x height, a standard size is 6” x 9”. 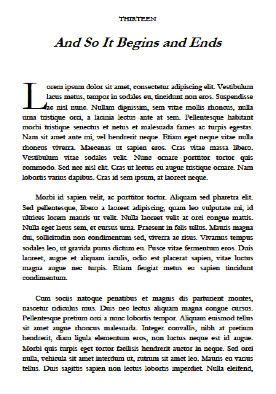 For your book to print properly, you need to make sure that your text document is set to match your trim size. Set your trim size by modifying the paper size of your document. Under Page Setup or Page Layout, choose Paper Size. Change from the default paper size to whatever trim size you’ve chosen and Apply to Whole Document. When establishing your trim size, keep in mind that the appropriate trim size for your book does depend upon the number of pages & your spine width. The more pages you have, the larger your spine width will be, and the smaller your overall trim size may need to be for the cover to print properly on the 17” x 11” sheet of coverstock. See Cover Layout Guidelines below. Your margins are the space between your text and the edge of your printed page. Proper margins are important, as they provide a buffer zone between the text or image and the edge of the page. As such, margins allow for minor variations in the trim size of each book. Also under Page Setup or Page Layout, set your Top-Bottom-Left-Right Margins. 0.8” is standard. Under Paragraph, set Tabs. Settings of 0.5” or 0.25” are standard. Single space is discouraged, as it is difficult to read. Spacing between 1.15 and 1.5 is suggested. Under Paragraph you can modify the settings for Line Spacing. Everything mentioned so far should be consistent throughout the document. 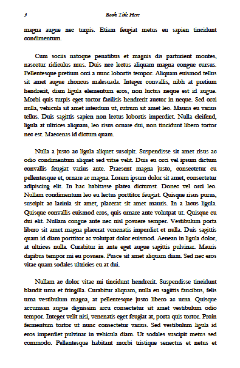 However, there will be some formatting options that should be applied to some pages and not others. The best examples are page numbers and headers. It may be helpful to separate your book into three documents, consisting of front matter, core matter and back matter. This way the pages in your core matter will have correct page numbers and headers, while the pages in your front and back matter will be free of any unnecessary markings. You can combine the files later when creating the PDF. title page, copyright page, acknowledgments and dedication, foreword, preface, introduction, table of contents, and any blank pages. your core text, where page one of your book actually begins. afterward, about the author, bibliography, index, glossary, etc. Decide if you want any headers or footers on your text pages – some books have the book title, chapter title or author name at the top or bottom of each page. Keep in mind that you can choose to insert them on odd or even pages only. Go to the Insert function to add headers/footers. They will appear in the space between your body text and the edge of the page. For example, if you set up a 0.8” margin on all sides, then the header/footer will appear within that 0.8” margin. Make sure that it is still at least 0.25” from the edge of the page. Choose a font that complements your body text font. Set it to about 2 points smaller than your body text size. You may want to italicize your headers/footers. Consider whether you want them centered on the page or aligned to the outside. Go to the Insert function to add page numbers. Consider whether you want your page numbers at the top or bottom of your page, centered or aligned to the outside of your page. Choose a font that complements your body text. Try using the same point size, or 2 points smaller (whatever looks best to you). Remember to use the Page Break function to start a new chapter or section. Do not hit the enter key until you scroll down to the next page. How do you want to begin each chapter or section? Choose an appropriate point size (bold, 2-4 points larger than your body text). Consider placement of the chapter heading – centered or aligned to the left; at the top of the page, or farther down? Consider the chapter drop – do you want the first paragraph to start at the top of the page or 1/3 of the way down? Do you want the first few words or first line of the paragraph to look different - indentation, capitalization, drop cap, bold? To create a PDF from a Word document, you can use Adobe Acrobat PDF Conversion software. If you don’t own Acrobat, Adobe offers an online subscription service that allows you to pay a fee to turn a set number of documents into PDF files. Go to http://createpdf.adobe.com. If using other methods of conversion, be sure to embed your fonts properly. the book. For images to be used on your book cover, scan in color, 300 dpi, scaled to the approximate size you plan to use in the book. Save either B&W or color images as TIFF files. Covers can be designed in a variety of software, including MS Word or Adobe InDesign. For layout purposes, your cover is the back + spine + front of your book, printed as one continuous sheet. The sheet wraps around the printed book interior and gets trimmed down to your specified size. Nothing can print on the interior side of the front or back cover. Before designing your cover, you must know your spine width. To calculate this, you’ll need your number of book pages (front, core and back matter) and the PPI (pages per inch). The PPI measurement is specific to the thickness of the paper you’re using. Our standard PPI is 434 (for Springhill Opaque 60lb cream paper). Keep in mind that the appropriate trim size for your book does depend upon the number of pages and your spine width. The more pages you have, the larger your spine width will be, and the smaller your overall trim size may need to be for the cover to print properly on the 17” x 11” sheet of coverstock. Once you know your spine width and trim size, you’re ready to layout your cover. - - - - - Indicates 0.5” margin from edge of cover, free of any graphic or text elements. Though not shown here, there should be a 0.5” bleed on all sides of the cover. It’s better to allow more cushion in your design than to crowd the margins. Background image or color should extend all the way to the edge of the bleed area. To place text on the spine, rotate it so that the left type margin falls at the top of the book. The type will then read correctly from left to right when the book lies front cover up on a horizontal surface. If you have your own ISBN and barcode, remember to put it on the back cover of your book.